Historically Cambodia's dry forests in the Eastern Plains supported diverse and abundant wildlife, including a large number of tigers. 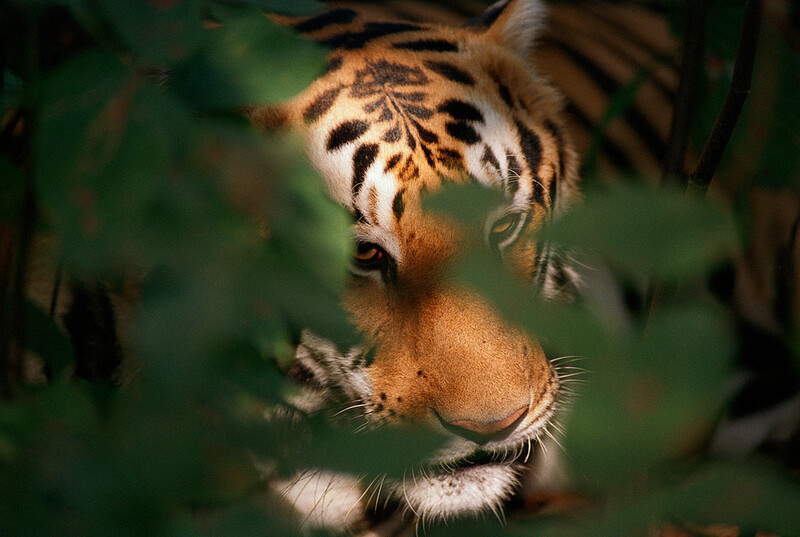 However, intensive poaching of both tigers and their prey lead to a rapid decline in the big cats. Today there are no longer any breeding populations of wild tigers in Cambodia and the species is considered functionally extinct. WWF is supporting the Royal Government of Cambodia's tiger reintroduction plans to bring tigers to the Eastern Plains Landscape. As one of the thirteen tiger range countries, Cambodia plays an important role in achieving Tx2 - the global goal to double wild tiger numbers by the year 2022. A pre-feasibility study of tiger reintroduction in the Eastern Plains Landscape was undertaken in 2013 by the IUCN and WWF. The reasons for tiger extirpation were examined and conditions for successful reintroductions identified. This study can be found opposite. Two peer-reviewed scientific papers monitoring and evaluating the densities of large ungulate species in the Eastern Plains Landscape can also be found. These ungulate species are a key source of prey for potential tigers, and it is from this data that a carrying capacity for tigers in the landscape was calculated. For all the latest wild tiger news and information about how countries are working to double wild tiger numbers, visit WWF's tiger website. Why should tigers be reintroduced to Cambodia? Tigers are one of the most iconic species on the planet, yet they are more than just a beautiful animal. Reintroducing tigers not only benefits Cambodia's forests and wildlife, but the people of Cambodia, too. Listed below are some key benefits of reintroducing tigers. 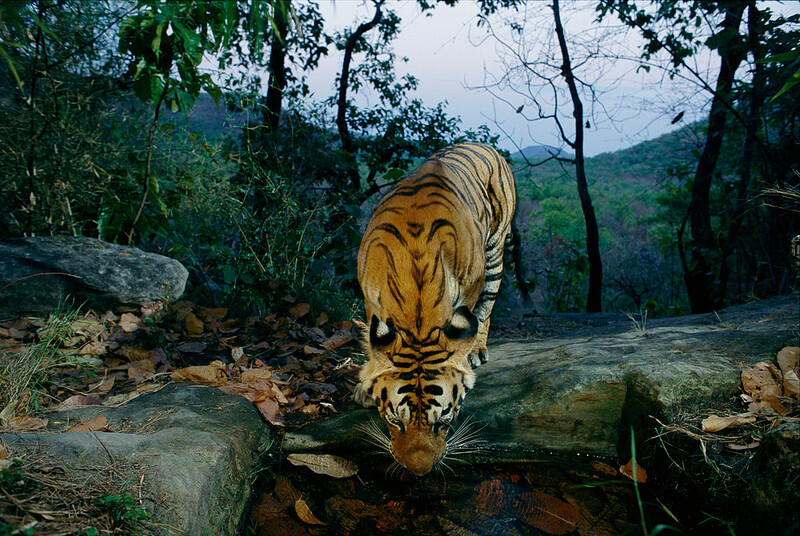 Tiger reintroduction provides unique opportunity as many tiger habitats in Southeast Asia such as mangroves or dense rainforest are not well suited for tourism, whereas Mondulkiri’s open and accessible forests offer an opportunity for successful tiger tourism. If tiger reintroduciton is successful, wild tigers in Mondulkiri will draw tourists, particularly those from East Asia, as an exciting new alternative to searching for tigers in India. It will encourage tourists to prolong their stay beyond a visit to Angkor Wat. Paired with the developing tourism around river dolphins, these species specific activities will elevate Cambodia’s tourist industry and will offer a unique experience in Southeast Asian tourism. On top of entrance fees, significant tourism revenue is earned through the supporting infrastructure including vehicle and guide hire, merchandise, hotels and restaurants - all of which can benefit the national economy . Tourism brings opportunity and income to local communities and deters poachers though an increase of attention on the area. It also hugely increases the value of maintaining a flourishing living ecosystem, which can in turn increase motivation for rangers and other frontline staff. Tigers are top predators of the food chain, meaning they play an important role in keeping the forest ecosystem balanced. Tiger reintroduction can contribute to a balanced eco-system which keeps the forests healthy, which in turn benefits people - from local people in Mondulkiri who rely on the forests for their livelihood to urban people in Phnom Penh who use forest products in their day to day lives. Healthy forests benefit the country as a whole by providing fresh water, clean air and regulating the climate to limit extreme weather, such as droughts and storms. 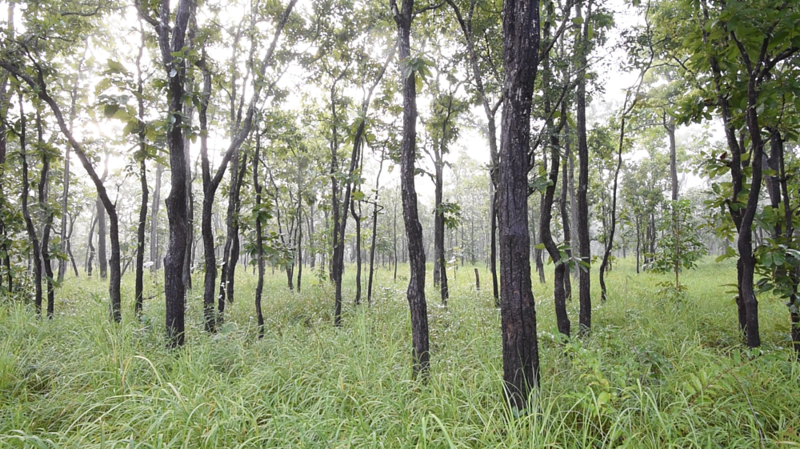 Large areas of intact forest - the preservation of habitat is beneficial to all species that reside there and keeps eco system services flourishing. Good prey numbers - this directly improves the protection of species that are tiger prey, such as banteng, muntjac and wild pig, which then indirectly benefits other carnivores such as leopards and dholes. Systematic biological monitoring through technologies such as camera traps - this improves scientific knowledge of other species and activities in the area as other wildlife is also captured on camera. Strict enforcement against poaching and habitat encroachment- an efficient ranger team and enforced laws against poaching help protect some of the forest's most vulnerable areas and rare species. Without a government-led restoration programme to prioritise land-use in the Eastern Plains Landscape for tiger recovery, it is unlikely that the forest will remain intact. This is due to competing land use aspirations from other sectors across the region. The Eastern Plains Landscape is a crucial habitat for 23 of the world's endangered and critically endangered species such as banteng, dholes and the giant ibis (the national bird of Cambodia). The Eastern Plains Landscape is also the last stronghold for leopards in Indochina and has the largest population of banteng in the world. The tiger reintroduction therefore brings crucial hope and increased protection for a large proportion of Cambodia's endangered species. A successful tiger reintroduction to an area of their historic range has never been done on this scale before. As one of the thirteen tiger range countries, Cambodia plays an important role in Tx2 - the global goal to double wild tiger numbers by the year 2022. This is one of the most innovative and ambitious conservation goals ever set that has managed to halt the sharp decline in wild tiger numbers for the first time in history. The tiger reintroduction in the Eastern Plains offers a major opportunity for Cambodia to reach it's national commitment towards Tx2, as well as contributing significantly to the global goal of doubling tiger numbers. Which areas will the tigers roam, and what do they eat? The Eastern Plains Landscape (EPL) is a vast forested region in northeastern Cambodia (and a small part of Vietnam) and is considered to be one of the best potential areas for tiger recovery in Southeast Asia. This is due to the extensive forests and availability of prey populations. The landscape spans an area of more than 30,000km2 and includes four key protected areas in Cambodia and one in Vietnam. These are: Lomphat Wildlife Sanctuary, Phnom Prich Wildlife Sanctuary, Srepok Wildlife Sanctuary, Seima Protected Forest and Yok Don in Vietnam. The Eastern Plains Landscape is characterized by a mosaic of different habitats and forest types. This range in forest type, rather than one continuous cover, is one of the reasons why the landscape is home to such a variety of wildlife species. The most abundant type of forest found in the region is deciduous dipterocarp forest. Typically this forest will have an open canopy combined with a grassy under-storey. The six species of Dipterocarp-trees found in the Eastern Plains landscape shed their leaves during the dry season months (November to April). Semi-evergreen forest also occurs in the Eastern Plains Landscape, generally in areas of higher quality soils and at higher elevation. These forests have a taller and more multilayered structure than deciduous dipterocarp forests. Bamboos are common in the semi-evergreen forests. The Eastern Plains Landscape of northeast Cambodia is home to six ungulate species, which will prove key prey species for the tiger when it is reintroduced to the landscape. Densities of three of these ungulate species are robustly monitored by WWF. Cambodia is home to the largest wild population of Banteng in the world, and as such, this large and relatively abundant ungulate is a prime prey species for tigers. In Cambodia, Banteng are considered to be the most beautiful and graceful of all the wild cattle species, and most likely to be the ancestor of Southeast Asia’s domestic cattle. Once fully grown, Banteng can weigh up to 900kg and reach 7.5ft in length. They are found in open areas close to dense thickets and forests in south east Asia and their diet consists of grasses and other vegetation. The Red Muntjac Deer is the most widespread of all of the 'barking deer' - named for their alarm call they make when a predator threat is nearby. Muntjacs are small in stature, but the Red Muntjac is one of the larger species, weighing up to 28 kg and would make a good source of prey for tigers. The Red Muntjac is generally nocturnal, but in protected areas where the animals are not being poached, they may be active during the day as well. They inhabit a wide variety of forest types and their diet includes young leaves, shoots, tree bark, grass and fallen fruits, as well as small baby birds and eggs. The wild pig (or wild boar as it is also known) is the ancestor of most domestic pig breeds and has one of the largest distributions of all of all terrestrial mammals. Wild pigs usually live in groups of between 6 and 20 individuals, although large herds of around 100 have been seen. Although it primarily feeds on fruits, seeds, roots and tubers, the wild pig is omnivorous and has been known to eat a wide range of foods, including some animal matter. Also present in the Eastern Plains Landscape of northeast Cambodia are Gaur, Eld's deer and Sambar deer.